Microfiber cleaning cloths are popular these days. 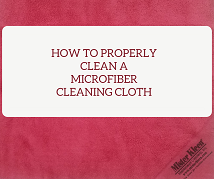 Made from polyester material, microfibers are more effective at cleaning up dirt and debris than a standard cloth or feather duster. Standard cloths and dusters will either push dirt and debris from one place to another or disperse it into the air leaving it to settle back down on everything just dusted. The electric charge from the microfibers, on the other hand, will actually collect and trap the dirt and debris. The uses are practically endless! The use of microfibers also helps improve building sustainability while improving the overall health and wellness of building occupants. 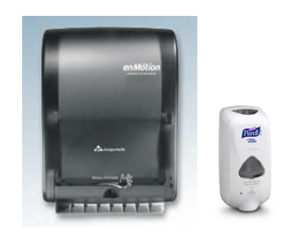 They are reusable and cut down, virtually eliminating the use of paper towels! 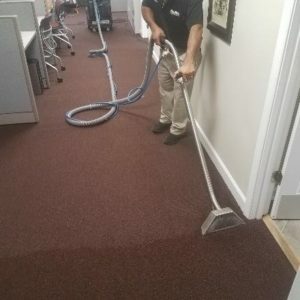 As a certified Green Seal GS-42 green cleaning company, Mister Kleen uses microfibers in its daily operations to clean tens of millions of square feet of high security and commercial office space in the D.C. metro region. Proper care is the key to the reusability and longevity of microfibers. And, how you use them determines the proper care. If you plan on using a chemical solution with your microfibers, then make sure you wash them with detergent only on a cool or warm setting. It is best to wash them on their own, but if you need to do a mixed load, be sure to only include other non-lint, synthetic materials. Cotton especially should be avoided. Also, don’t overload the washing machine! Microfibers are extremely absorbent and filling your machine up to the top with dry microfibers could end up with you shopping for a new machine or replacing a burnt out motor. In terms of detergent, use one that is clean-rinsing. Powder laundry detergents often leave a soapy residue in the fabric, and many liquid detergents contain strong perfumes, which can be bad for microfibers. Avoid using bleach as this will eliminate the electric charge that makes microfibers so effective. When drying microfibers, it is best to air dry. This will not only make them last longer, but it will also prevent them from picking up loose particles that often get caught up in tumble dryers and high heat conditions. If air drying is not an option, then tumble dry on low or no heat – high temperatures will melt the fibers – and, dry with similar materials. As with bleach, do not use fabric softeners as they can destroy the electric charge in the material. Lastly, never iron your microfibers. Remember, extreme heat will damage them. If you aren’t planning on using a chemical solution with your microfiber cleaning cloths then the only difference when washing is to avoid the use of laundry detergent – water is all you need. In terms of drying, the same methods mentioned above apply. In a nutshell, bleach, fabric softener, and high heat should be avoided when laundering microfibers. Microfiber cloths will continue to be a popular cleaning material used for many years. By following these guidelines, you will be able to get the most out of your cleaning and prolong the life of these valuable cleaning cloths. Mister Kleen is a leading provider of contract cleaning services to Commercial and High Security facilities since 1976. Our primary service areas is the DC Metro region. We also provide a variety of interior and exterior specialty services.